FOR FAMILY LOVE FEST ! Guests are invited to select from this interesting collection of beads, and use our workspace to design, string and complete their unique piece of jewelry. We assist our guests with technical instruction so that each piece is professionally finished. How great is that? We're busy supporting creativity, therefore we are unable to offer repair services or take commissions at this time. Thank you for your understanding! We consistently update our collection, procuring a variety of materials from around the world to keep your creativity and curiousity at its peak! Shown here, additions to the Semi-Precious Stone inventory, including elongated Turquoise ovals and barrels, large faceted Citrine rondelles, Green Kyanite top drill "sticks", large faceted Amazonite rondelles, Lapis slim center drill discs, Eye Agate, Green Garnet, Tourmaline, and Labradorite. Available for purchase by the bead or by the strand. Additions to our Glass Collection include Chinese Lampwork Flower Beads, firepolish, table cut, and pressed beads in a variety of shapes from the Czech Republic, as well as colorful, protective Eye Beads for unique designs! Enjoy fresh restock items in our case and crystal gallery! Sterling Silver and Semi-precious one-of-a-kind stone rings, Golden Hair Rutile Quartz standing point crystals, and Sterling Silver and Gold Vermeil faceted stone droplets (so cute!). Special Event! Tibetan Singing Bowls! In addition to an incredible array of beautiful beads for purchase, we offer The Soul Beads Jewelry Collection, an original collection of timeless, organic jewelry for modern adornment, hand crafted by shop owner/artist in residence Holly Neubuerger. We invite you to browse The Soul Beads Jewelry Collection at the shop and choose a unique, soul stirring piece of jewelry to add to your personal collection of expressive adornment. This series reflects a conscious choice of materials and placement to support the woman's journey of life. Imbued with various qualities such as strength, courage, confidence and integrity, healing and awareness, love and compassion, etc..these inspired designs are intended to embolden and celebrate You, as The Empowered Woman! 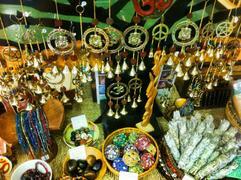 We offer a selection of Semi-Precious Stone Hearts, graceful Diety statues, and stone pendulums (pitured below). 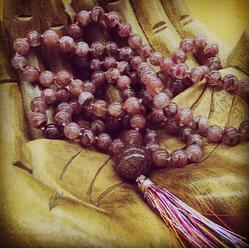 Don't miss our Crystal Gallery, full of a variety of standing Crystal Points, and our "Sacred You" Collection, malas (Prayer Strands) from India, Nepal, and China. From as early as she can remember, Yvonne Cabalona has had an interest in beads and beadwork. For almost 20 years, she has been involved in serious study and accomplishment in her chosen craft. Her noted abilities include a keen sense of style and color and accomplishments in a variety of techniques. Her curiosity and determination leads her to delve into some of the more obscure areas until she masters them. Student evaluations include high marks for patience, communication skills, one-on-one interaction and general beading knowledge. For over three decades, Jamie Cloud Eakin has been a professional bead artist, teacher and perpetual student of her craft. Her original designs are collected by discriminating buyers in fine galleries across the United States. Jamie's designs have been featured in numerous books and periodicals including The Beaders Color Palette by Margie Deeb and Beading with World Beads edited by Ray Hemachandra. She is the author of Beading with Cabachons, Bugle Bead Bonanza, and Dimensional Bead Embroidery, published by Lark Books. Student evaluations include high marks for preparation of class materials, general/specific bead knowledge, energy level and ability to communicate. C. R. Radding sews soft furnishings for interior designers, while exploring her own personal creativity. A life long fascination for all types of art and needle crafts lead to the discovery of beading and wire work where she knew she’d found her creative “home”. For over 17 years she has been teaching and sharing her skills all around California and various parts of the country. We Continue to Create to Inspire and Delight!